There’s something magical about a house with tower. Although towers reached a peak (sorry) of popularity in the Victorian era, towered houses were still relatively rare. Additionally many towers have been cut off, losing their distinctive roofs. This unused Real Photo postcard from the collection of Robert Schroeder shows a special Queen Ann style home that can be seen at 1038 21st Street in the National Register Broadway Historic District. Mr. Schroeder, who is also the great great great grandson of Col. George Davenport, inherited many Real Photo postcards from his grandmother. Most were created between 1910 and 1920, probably by a family member. This means they are exceedingly rare – perhaps one of a kind — and we are fortunate to be able to share some of them in the coming months. Residential growth in the 21st Street area – as well as many other areas of Rock Island – was stifled by Bailey Davenport, who owned hundreds of acres in what is now metropolitan Rock Island which he refused to sell. After Bailey’s death in 1890, his land finally came on the market. One of his acreages was purchased in 1894 by developer and investor Mansfield Sturgeon who platted (subdivided) it as the “21st Street Addition”. The lots on this desirable hillside sold quickly. 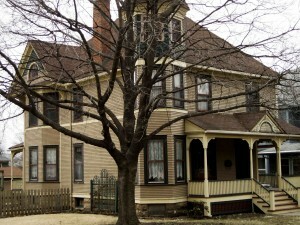 An early purchaser was a recently wed couple, Hugh and Julie Greenough, who wasted no time building this home in 1895. Mr. Greenough was a director of the Rock Island and Peoria Railroad, which was later absorbed by the Rock Island lines. In 1904, he was appointed superintendent of the Cedar Rapids division of the railroad, which required a family move. The Greenoughs sold the house to the Scott family. John Scott and his wife, Amy, shared the home with his mother, Margaret, and, until his death, his father, William. John served as the City Attorney for Rock Island from 1899 to 1904, when he was elected State’s Attorney for Rock Island County. In this position, he is remembered for declining to prosecute John Looney. He later returned as City Attorney and maintained a private law practice as well. The Scott family lived here from 1904 until 1948. Their long tenure may explain the lack of changes to the exterior of the home — what historic preservationists term “integrity” — that extends to the rear of the property as well. Nearly all of the original architectural features remain, making this an exemplary and pristine example of the towered Queen Anne style home. The tower is hexagonal at the third story level, where it is covered with wood shingles, and is surmounted by a steeply pitched six-sided roof. At the lower levels, even extending to the foundation, the tower becomes a large five-sided corner bay. The original roof was wood shingles with “Yankee” gutters visible on the postcard. Yankee gutters are built into the upper edge of a cornice or into the rafter ends and are nearly invisible from the ground level. They give a crisp, sharp look to the roof edge but are expensive to construct, and must be carefully maintained to avoid water damage to exterior walls. Yankee gutters throughout the country have been largely replaced with metal roof-edge gutters. The wood siding is original, with narrow clapboard on the lower stories and both wood shingles and clapboard in the attic gables. This exceptionally narrow siding is typical of homes built between circa 1890 and 1915. In earlier and subsequent years, wider clapboard of various sizes predominated. Note the large awnings on the second story windows. 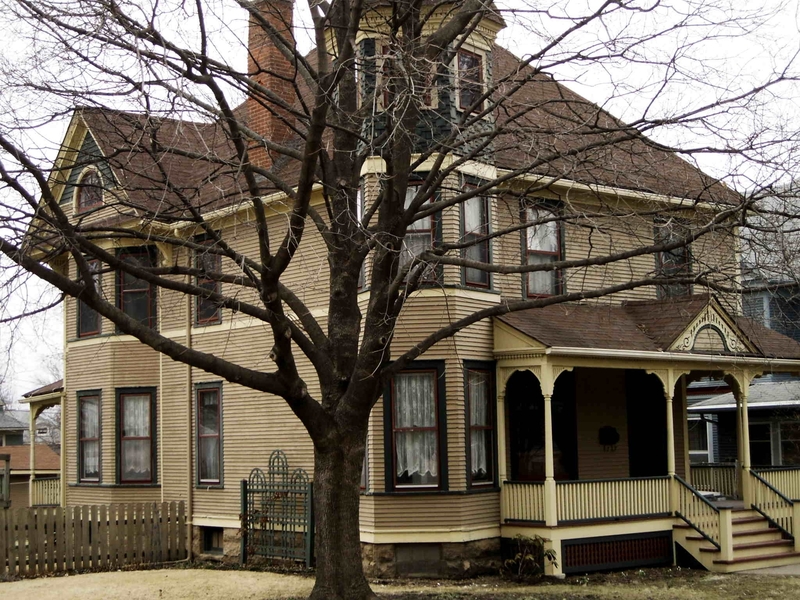 Victorian homes were designed to maintain a comfortable interior without air conditioning. Natural ventilation (hot air flows out of the attic windows), aided by awnings to block hot summer sun, was surprisingly efficient and definitely inexpensive. The south attic gable, extending above a two-story bay window, contains a huge semicircular “demilune” window separated with delicate “muntins” into smaller panes. This window foreshadows the Colonial Revival style which will soon replace the Queen Anne in popularity for residential architecture. Dentils – notched teeth – visible under the porch and tower roofline are also more common on the later style. 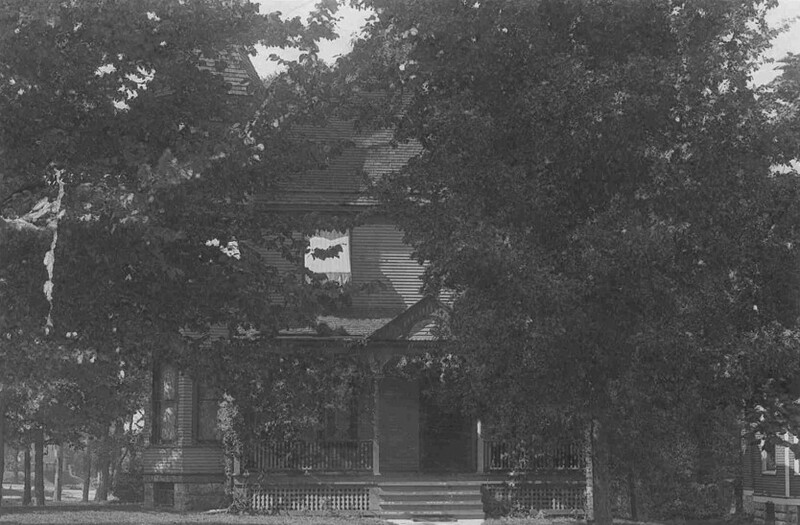 The front porch, peeking through climbing vines, is ornamented with a small gable containing a cutout panel over the stairs and similar jigsaw cutwork brackets the round, lathe-turned porch columns. The postcard shows a balustrade with square spindles while the underporch area is covered with simple rectangular latticework. In more recent years, the balustrade was modified with widely spaced spindles and diagonal lattice appeared beneath the porch. However the current owners completed an award winning restoration in 2001 by recreating the missing elements as well as doing needed structural work. They were more fortunate than many restorers because they could use this postcard as a guide. It is surprising that, despite being built in an era when ladies could easily trip over their long skirts, there are no handrails on the porch steps. Remarkably, even the small garage is original or nearly so, dating from at least 1906 when it appears in Sanborn Fire Insurance maps. It is a simple gabled structure covered with the same narrow clapboard as the house. The outstanding and vintage folding doors are an exceptional feature. This article, by Diane Oestreich, is slightly modified from the original, which appeared in the Rock Island Argus and Moline Dispatch on January 1, 2006. Note: In 2007, the owners completed the restoration of the front porch, for which they received an award from the Rock Island Preservation Society.